Aʟᴏɴɢ-Tʀᴀᴄᴋ S.A.S. was created in December 2014. It is owned by 4 associates who all have a PhD in science. The main motivation of this young company is to boost the use of satellite remote sensing data into environment protection, humanitarian and security oriented applications and services. The company implements an original concept that mixes both consultancy and independent research activities. This makes it possible to perform internal as well as external R&D studies and develop prototypes in the field of remote sensing with a specific target on space hydrology and sea-ice. Hydrology (AltiHydroLab.fr initiative) for the monitoring of inland water resources and their evolution over the three last decades. Sea-Ice (SeaIceDataLab initiative) for both climate monitoring and safe navigation near the poles. We are already assisting the space agencies and their contractors by contributing to breakthroughs in remote sensing algorithms and in the cross-validation of high level products derived from multiple missions. Our planet is experiencing a faster climate change than initially expected. The impacts are many, among which the changes in continental surface water resources as well as ice and sea-ice extent at the poles. Aʟᴏɴɢ-Tʀᴀᴄᴋ is concerned with providing technology to monitor these changes, raise awareness and provide alerts thanks to satellite observing systems. Extreme events, such as droughts and floods, are forecast to increase as climate change takes hold. Agriculture is among sectors most vulnerable to the impacts of climate change; water supply for example, will be critical to sustain agricultural production and provide the increase in food output required to sustain the world's growing population. In particular, fluctuations in the flow of rivers are likely to increase in the twenty-first century. Based on the experience of countries in the Nile river basin (Ethiopia, Kenya and Sudan) and other developing countries, depletion of water resources during seasons crucial for agriculture can lead to a decline in yield by up to 50% . (1) Agriculture can both mitigate or worsen global warming. For example, in some places the extended duration of the dry season is worsen by new intensive agricultural practices that require more water than the traditional ones. As a consequence small reservoirs disapear and lakes are shrinking which requires more efforts to access water. According to a report by the International Water Management Institute and UNEP, there is not enough water to continue farming using current practices; therefore how critical water, land, and ecosystem resources are used to boost crop yields must be reconsidered. (1) As these issues occur over wide and sometimes trans-border geographical areas, it is hard for the authorities and humanitarian organizations to monitor the changes and to detect all of the critical situations. Satellite radar altimers and imagers offer night and day, all weather observing capabilities. They have the potential to regularly monitor the surface waters at regional and local scale. Nevertheless operational services are still missing. Mainly for two reasons : altimeters where initially designed to monitor oceans and scientist adapted the data processing techniques (retracking) from ocean to earth surfaces. The classical retracking techniques are not optimal for inlan waters (results are innacurate over small reservoirs and rivers). Thus the services cannot run in an automated way. For this reason only well gauged and well studied sites are addressed by the existing spacehydrology services. some technological locks are still to be broken to allow for automated processing and validation with insitu or cross-validation with long term validated series derived from previous altimeters. In the context of global warming new roads are opening up with less and thinner sea-ice, unfortunately making it possible to increase human activity such as shipping and the search for oil and gas. Nevertheless these roads are changing over time due to strong currents and need to be carefully monitored to avoid major hazards. Here again remote sensing satellites have a role to play. 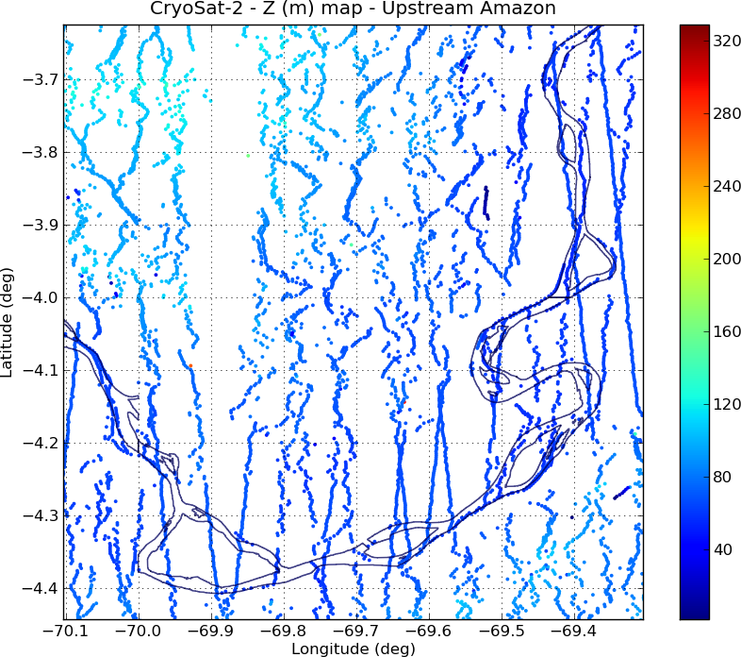 The remote sensing of sea-ice brings similar issues than those found on hydrology. The additional difficulty is that ground truth is is not easily at hand as the scene evolves quite fast (due to surface currents and atmospheric conditions). Repeated measurements are unlikely over few days. For these reasons, the existing services suffer either from poor validation, and/or low spatial resolution and/or small coverage. Aʟᴏɴɢ-Tʀᴀᴄᴋ is bringing new ideas in to solve the aforementioned issues. Both over the inland water scenes and over sea-ice areas the dominant echoes mostly come from water surfaces, which may be off-nadir in contradiction to the homogeneous scene in the open ocean that favors the nadir direction. This was recently showned (Fig.A) by a member of our team [Bercher2013c] thanks to the ESA level-2 SARin mode Cryosat data. Fig. 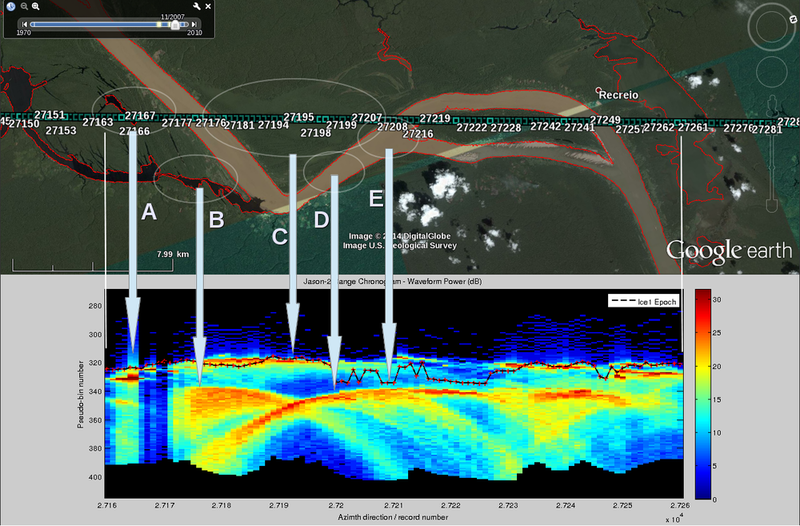 A : Map of surface topography, derived from ESA Cryosat-2 SARin L2 products over the Solimões river (Brazil). A lot of the SARin measurements are focused on the river network sometimes kilometers away from the satellite's ground track. In complex situations with multiple inland water bodies inside the radar footprint, individual waveforms result from the weighted sum of the reflectors' echoes with a weight that evolves as the position of each reflector changes within the footprint. This leads to a difficult cout of model waveform whereas the range chronogram (used by our retracker) gives the complete history of each reflector which is a lot more information as can be seen in Fig. B ! Due to its high inclination, the SARAL mission is well suited to sense the cryosphere. Together with our colleague Sara Fleury from CTOH/LEGOS, we recently observed that the AltiKa waveforms are very peaky over polynyas and exhibit a very high dynamic range up to 20dB as show in Fig. C where the AltiKa acquisition is collocated in time and space with a LANDSAT8 image. In some case the Automatic Gain Control system reaches its own limits and the waveforms are saturated. The altimeters' AGC shall be carefuly monitored over the cryosphere. Fig. C. SARAL/AltiKa Range-Chronogram (left) obtained from the succession of waveforms along the track that is itself superimposed to the collocated Landsat8 image (middle). The waveforms have been amplitude-corrected with the AGC gains depicted on the (right) but not aligned via the onboard tracker window (the hyperbolic range signature is hidden). 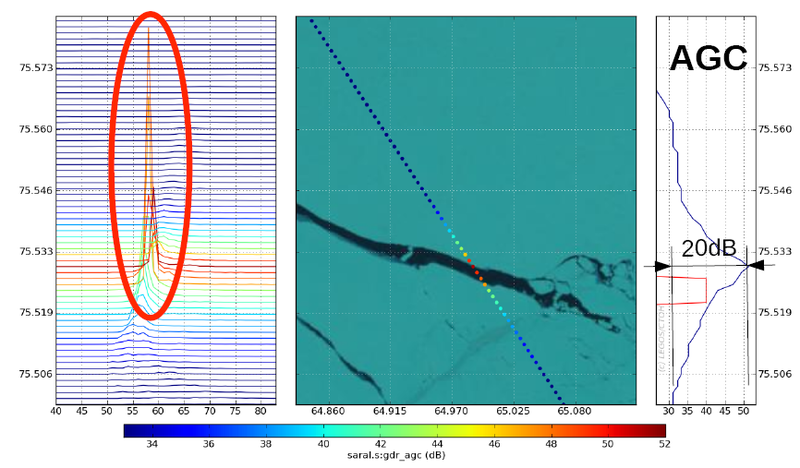 The scene corresponds to the flight over a large polynya in Arctica. Peaky waveforms and high dynamics of the AGC can be observed and may cause troubles to standard retrackers. EGU 2016 SHAPE Poster available online! GGHS 2016 SHAPE Poster available online!